Is there a better alternative to TimeLine? Is TimeLine really the best app in Cooking category? Will TimeLine work good on macOS 10.13.4? 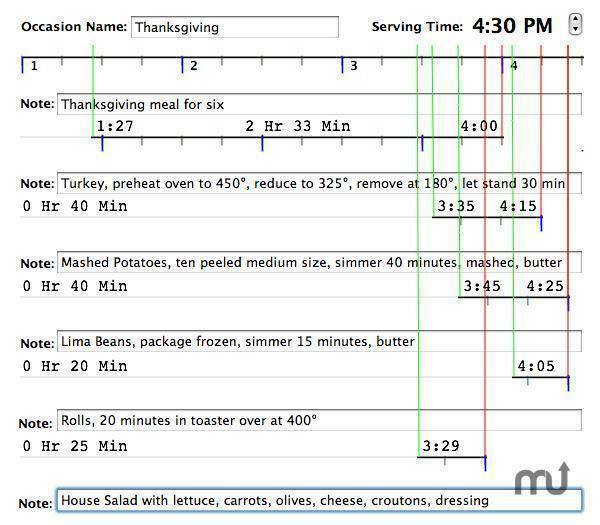 TimeLine lets you plan food preparation and save the planning information. Replaced Kagi (which closed) with PayPal. If you are registered, there is no need to upgrade. TimeLine needs a review. Be the first to review this app and get the discussion started! TimeLine needs a rating. Be the first to rate this app and get the discussion started! Each occasion has a master timeline plus up to five timelines with start, stop, duration times, and comments. The start and stop times generate colored lines up to the master timeline. A Cooking calculator is included. Each occasion can have a note to use for recipes, etc. Timeline and note information is saved automatically when the application is closed; you can also use File > Save As... to save the information with a different name. Files are saved in a "TimeLine" folder in the user's Documents folder. Screenshots can be made for viewing and printing. The Help and Note information can be printed. TimeLine is $10 shareware which can be used in demo mode for ten launches before it must be registered.